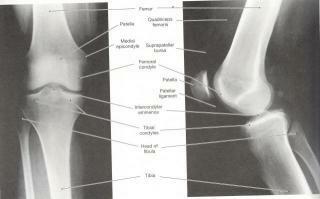 The knee is probably subjected to more pain and surgery than any other joint in the human body. 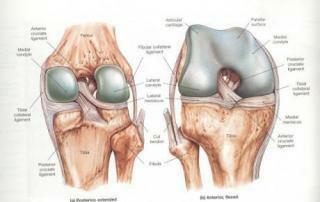 Some 800,000 knee replacements and orthoscopic surgeries are performed in the USA each year. Some are acute or traumatic injuries, but most are wear-and-tear or overuse-type injuries due to poor exercise selection, carrying excess bodyweight, and pro-inflammatory food selection. Three things happened this week to prompt me to write this article. One, I saw a guy working out at my local fitness center with his trainer obviously doing 'leg day.' This consisted of squats into lunges, followed by leg press with some knee extensions, and some smith machine squats and leg curls for dessert. Whether you are familiar with these exercises or not, you probably know that all of them involve the knee joint. It wouldn't be so alarming if the resistance wasn't so excessive, other exercises were mixed in, and his form was even in the ballpark. This was a 'No Pain-No Gain' type of session. Two, I saw an extremely overweight woman outside jogging, obviously in pain with every step she took. Three, I watched at a traffic light, a group of three men running. Two of them were wearing knee braces. Obviously it was a distance and training day as they had multiple viles of colored water lashed to their fanny packs. Each one of these instances caused me to think: What the heck are these people doing? What are their goals? What possible detriment or injury are they promoting on their bodies? All had good intentions thinking they are doing something good for their bodies but in reality here's what happened and the mistakes they made. In the first instance over-training, and lack of progression and variation are the culprits. Even more alarming under the guidance of a personal trainer. Most exercisers, for most goals, do not need an entire workout session dedicated to loading the legs. There isn't a heck of a lot of difference between a squat, a leg press, and a lunge. Hip-Knee-Ankle in all three exercises just changing the alignment, stability, positioning, and anchoring. Supplementing, (Isolating), with knee extensions is just insult to injury. Overloading the body this way each and every time you go to a gym is not what exercise is about, whether it be legs or any other body part. It is a sure way to promote and accelerate arthritis. And, just because your heart rate is elevated and sweating does not mean it's a safe or effective workout. In the second instance, someone has been told that jogging is the best or only way to lose weight. I say it time and time again, eating is 80% in achieving desirable weight and your optimal frame. For someone who is carrying 40 pounds or more of excess weight, the pounding of long-duration jogging is doing more harm than good. The forces through each knee exceed 2.5 times your bodyweight with each and every stride. A better tactic would be to try and jog for 30 or so seconds, walk 2m, then repeat for 20 or so minutes. In the third instance, if you have to wear a brace to perform an activity you should stop, rest, seek some type of medical or therapeutic treatment. Having to wear a brace due to pain is a warning sign you are doing something to the body you shouldn't be doing. I have a big beef with distance running for many reasons but the two standouts are increased internal inflammation, called systemic inflammation, and promotion of premature cartilage degeneration. Humans are not endurance animals, period. The knee is a junction connecting the upper leg bone to the lower leg bones. 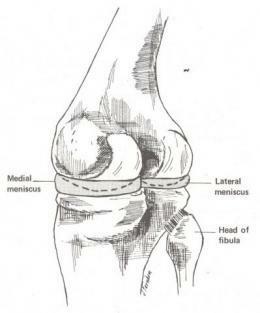 Femur to tibia and fibula, with a patella (knee cap) thrown in to protect the front. 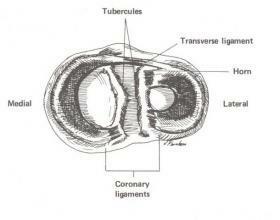 It is called a hinge joint, unlike the the hip, which is a ball and socket joint. Hinges, like the ones on your gate, move forward and backward, there is little motion available for rotation and definitely less side to side. The ends of the bones are coated with cartilage. 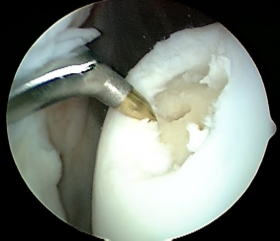 Cartilage is smooth and provides lubrication and cushion to a joint. 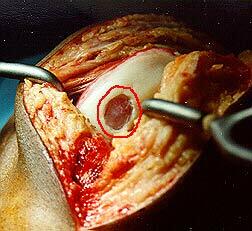 Abuse to cartilage is due to overuse, (and abuse), and results in its downfall: tears, decreased thickness, and eventually arthritis. Another often overlooked fact is that Cartilage is very susceptible to inflammation due to eating inflammatory foods. Inflammation due to excessive repetitive exercise, (like jogging or cycling), continual ingestion of inflammatory foods, (like grains), and excessive loading, (heavy multiple leg exercises), all contribute to cartilage degeneration and probable surgical intervention. Pain may be the final straw in cumulative degeneration so tactics to treat the knee with respect and not abuse it are critical; rotate your tires so to speak. Although exercise is necessary, the wrong kind can do more harm than good. Over-training is no joke and the wear can take years to show up as pain. Knees have to last a lifetime and no one wants to have surgery. Too much, too often will lead to injury.